If your kids love Wild Kratts, there’s no better theater show to take them to than Wild Kratts – Live! This fantastic theatrical adaption of the popular TV show is coming for one special night to the Bob Carr Theater on Saturday 3rd March 2018! Early booking is highly recommended to get the best seats!! Starring brothers Chris and Martin Kratt, the show teaches children about zoology, biology and ecology in a fun-packed, exciting story. Adventure with the brothers as they rescue animals, protect the environment, and make the world a better place. With the aid of their “creature power suits,” made by their friend Aviva, they can gain the unique abilities of certain animals to help them save the day! 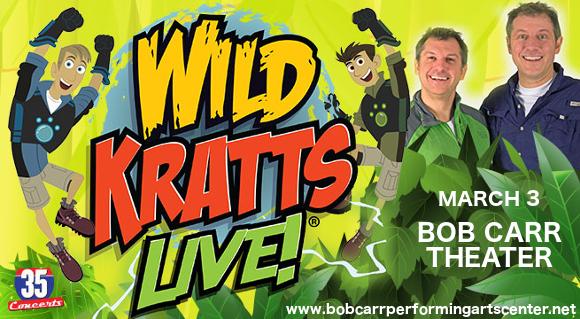 Treat your child to an experience they’ll cherish – book your tickets to see the Wild Kratts LIVE today! !